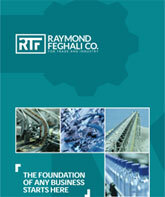 Raymond Feghali Co. For Trade & Industry was established in 1972 at Zalka, Beirut by its chairman Mr. Raymond Feghali. It has become one of the leader companies in the market to provide industrial parts and technical solutions with high quality and best prices. In 1997 Mr. Fadi Feghali joined the company and started to expand it by importing new brands, enlarging the range of products and introducing a new department managed by professionals and experts engineers. In 2007 a new branch was founded in Ghana and after few years another in Nigeria. In 2013 a new sister company R.T.F was established at Roumieh, Beirut to increase the company capability and follow the fast growth. Raymond Feghali Co. vision is to keep the industry on a high level of improvement and development to satisfy its local and frontiers customers by dealing with the most important suppliers in Europe, Far East, USA and other countries to meet the customer demands and offer them a wide range of high quality products. The company mission is to earn the trust of customers by delivering full support, side visits, acquiring wide range of industrial products in automation and power transmission, electrical motors, gearboxes, pneumatics and hydraulic components, handling and plant equipment in addition to weighing products and lifting tools. The commitment to quality, precision and innovation has made Raymond Feghali Co. one of the best choices for top wholesalers and retailers on the market.The continuous growth of the company is in direct relation with the improvement of customers in the industrial field.